Sir Gus the Camel, originally uploaded by QuakerVille. Every once-in-a-while you have to risk a pile up on the turnpike while you reach around to the back seat to grab the camera for a quick shot. 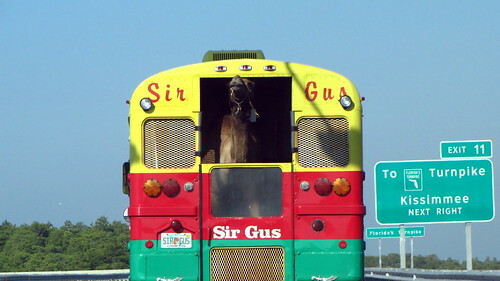 Sir Gus the Kissing Camel is a mascot for the Shrine’rs in Orlando and his caravan was spotted just outside Orlando getting on the Turnpike. This bright yellow, red and green bus is Shangri-La to the single humped Camel and is the greatest marketing tool for the organization. I just had to grab a quick picture even though we were clipping right along. I got so close to the back of the bus that Gus began spitting at me. I first though it was beginning to rain but quickly realized that it was perfectly clear. Enjoy the shot. Previous Post Osprey Takes a ride!